Sierra Leone’s vice president has asked the United States for asylum after soldiers surrounded his home. Samuel Sam-Sumana was expelled from the ruling party last week, and says he now fears for his safety. Sierra Leone’s Vice President Samuel Sam-Sumana (above right) requested asylum at the US embassy in the capital Freetown on Saturday. “I have fled my house and am with my wife in a place I cannot disclose, waiting to hear from the US ambassador, whom I have asked for asylum,” Sam-Sumana told news agency Reuters. 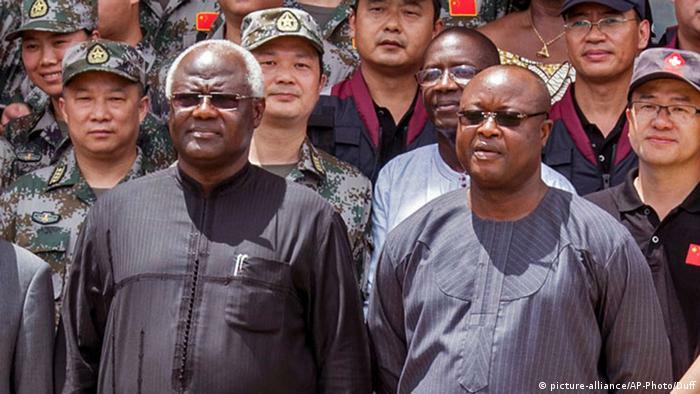 Sam-Sumana said he fled his residence after learning early Saturday that his security team was being disarmed on orders from the president, Ernest Bai Koroma (above left). Sam-Sumana was expelled from the ruling All People’s Congress (APC) earlier this month, accused of “orchestrating political violence,” “harboring a group of thugs,” and trying to form his own political movement in his eastern home district of Kono. Despite his expulsion, Sam-Sumana has remained in the post of vice president. Spokeswoman for the US embassy Hollyn Green said she couldn’t comment, but confirmed the vice president was not at the embassy. “There is no comment at the moment and there is no action on our part,” Green said. Sam-Sumana is currently under a 21-day Ebola quarantine after one of his bodyguards died of the virus. The hemorrhagic fever has killed more than 10,000 people in West Africa, devastating Sierra Leone and neighboring Liberia and Guinea.